Finally your man cave is complete and your bar is in place. Now you are ready to stock your bar and it is time to enjoy your favorite libation! What makes a man cave better than others is having a perfectly stocked bar. Stocking your bar means not only getting your favorite beer but also getting the right hard stuff for mixed drinks. Of course you will want to stock your basic vodka, rum, gin, whiskey, dry and sweet vermouth, sweet & sour mix, bitters, juices, sodas, and tonics. To make it extra special for you and your buddies, you will want to stock your manly bar with nothing but the best. A few top shelf whiskeys, bourbons, or scotch like Johnny Walker, Makers Mark, Crown Royal, Jameson, or a nice bottle of Woodford Reserve are a must have for any man cave. Having the best on hand will not do you any good unless you know how to prepare the drink properly. This is where one of the many drink mixing books come in handy. You can retire to your man cave for the evening and try your hand at mixing drinks and impressing your friends with your mixology skills. ChefLand 13-Piece Professional Bar Set, Stainless Steel A nice inexpensive set of tools so you will look like a pro mixing drinkings behind your bar. It is everything you need to get started. The Ultimate Bar Book: The Comprehensive Guide to Over 1,000 Cocktails It has classic and trendy new drink recipes so everyone is sure to find a pleasing drink. This book also covers related topics such as glasses, tools, garniches and mixing tips. Tovolo Sphere Ice Molds - Set of 2 These are great ice molds and at the time of ordering from Amazon.com you can select either cubes or balls. This gives your sipping whiskey or bourbon a touch of class. TableCraft 2 Pack Hinged Flip Top Pourers These are great for regulating the flow by adjusting the angle of the bottle as you pour. Rim your glasses in style and serve the perfect Margaritas, Bloody Marys and Gimlets. Folds for easy storage. Anchor Hocking 12-Pack Heavy Base Shot Glass Set, 1.5-Ounce don't over think it! A classic shot glass at a great price. The heavy base feels good in your hand. Kikkerland Dapper 'Staches Silicone Drink Markers, Set of 6 So you have all your bros over for the big game and don't want to swap spit. Use these drink markers keep everything in its place. Choose from mustaches, glow in dark graffiti, kisses, skulls, and more! Whiskeys and bourbons are very important liquors to have in a man cave. Most men like to relax or celebrate with an occasional Old Fashioned or Manhattan cocktail and it tastes even better when made with top of the line liquor. With top shelf bottles like these, you are sure to please all your friends. 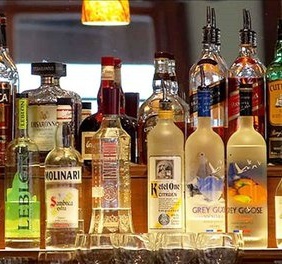 Next is to stock the vodka, you should carry one of the top three vodkas for a man cave bar. These top three vodkas are Grey Goose, Kettle One, and Absolute vodka. Having at least one of these three bottles is sure to please any vodka drinker. You will also need a good bottle of gin, preferably Tanqueray or Beefeaters gin. A popular bottle of rum to carry would be Bacardi which will please those rum and coke lovers. At some point tequila shots or margaritas will probably be made in your man cave and you will want to have a decent bottle of tequila on hand. Always be safe and purchase a good bottle of tequila like Patron. Even better, make your man cave bar the ultimate by stocking both Patron Gold and Patron Silver. Most importantly, you can’t forget the beer. If you do not have a tap, then just having a stocked refrigerator with your favorite beer will be fine. Lastly, remember to have garnishes for your mixed drinks. You will need cherries, cherry juice, lemons, limes, oranges, and most importantly olives for those martinis! Have your fruit fresh, cut, and ready to serve. All these little extras added to your home bar will make your man cave the ultimate place to be!